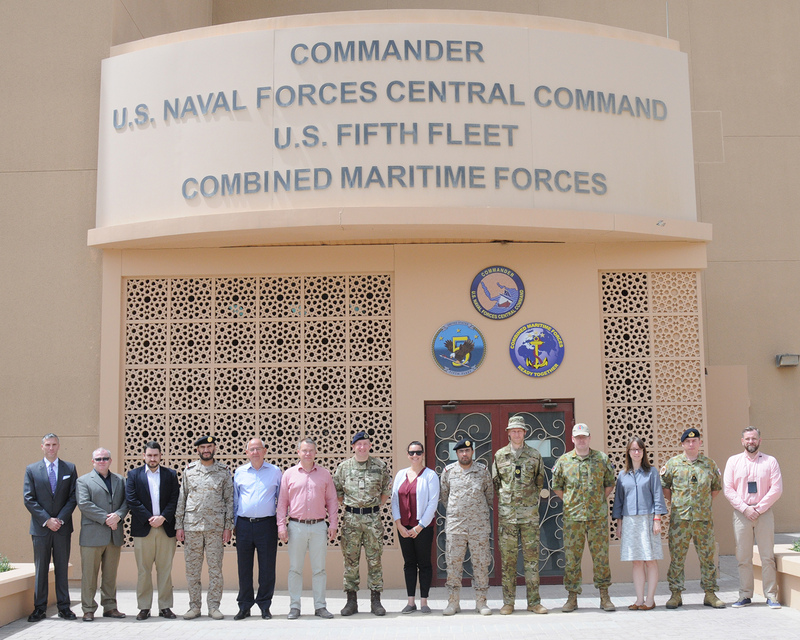 The third annual Combined Maritime Forces (CMF) Legal Conference was held recently at the Naval Support Activity (NSA) Base, Bahrain during 8-9 April. The Conference, coordinated by the CMF Legal team comprised of Commander James Farrant, Royal Navy, and Lieutenant Kurt Ploszczyniec, Royal Australian Navy and was designed to provide an overview of CMF operations from a legal perspective and to encourage robust legal discussion of the resultant legal issues at the unclassified level. The Conference was attended by specialist legal and warfare representatives from and Australia the Defence Forces of Pakistan, Denmark Kingdom of Saudi Arabia, New Zealand, United Kingdom, United States, as well as representatives from NATO and the European Naval force (EUNAVFOR). In addition to specialist legal and warfare officers, the Conference was also attended by representatives from the United Nation’s (UN) Office on Drugs and Crime, as well as the US Naval Criminal Investigative Service and Royal Canadian Mounted Police. There was a large mixture of experience, expertise and operational focus which lead to detailed discussions on issues of investigation and prosecution of narcotics smugglers. Also discussed was the relatively recent introduction of UN Security Council Resolution 2182 on the charcoal and weapons smuggling relating to Somalia and its associated legal and operational complexities. Other topics included legacy piracy issues such as ongoing prosecution and the detention of convicted pirates, flag verification boarding’s on the high seas, and the emergent issues of Private Armed Security Teams and floating armouries. Key note speakers included Captain Kevin Brew of the US Fifth Fleet JAG Office as well as the Deputy Commander CMF, Commodore Will Warrender who welcomed attendees and further discussed the CMF mission and mandate. Next Next post: UKMTO Dubai welcomes the Commander of the Combined Task Force 151.